I'm not sure why I am surprised. Her previous books, The Choice and The Waiting were read pretty much the same way. The Search, I think, is my favorite. Fifteen years ago, Lainey O'Toole made a split-second decision. She couldn't have known that her choice would impact so many. Now in her mid-twenties, she is poised to go to culinary school when her car breaks down in Stoney Ridge, the very Amish town in which her long-reaching decision was made, forcing her to face the shadowed past. Bess Reihl is less than thrilled to be spending the summer at Rose Hill Farm with her large and intimidating grandmother, Bertha. It quickly becomes clear that she is there to work the farm--and work hard. The labor is made slightly more tolerable by the time it affords Bess to spend with the handsome hired hand, Billy Lapp. But he only has eyes for a flirty and curvaceous older girl. Lainey's and Bess's worlds are about to collide and the secrets that come to light will shock them both. "Beautifully written, 'The Search' is a skillfully woven story that takes readers through unexpected twists and turns on the long country road toward truth. Fans both old and new will find themselves immersed in this heartwarming--and surprising--tale of young love, forgiveness, and coming to grips with the past." It is laugh out loud funny at times. There were so many fascinating women in this story. Of all types. Bess is tongue-tyed and totally infatuated with Billy. Betsy is a manipulative flirt. Bertha is Bertha -- though especially early in the story, she doesn't seem particularly Amish. Lainey is English, not Amish, and she is fascinating. Her friends provide an interesting non-Amish perspective. Sallie never stops talking and her twins are wild. Most of these women change -- or how we see them changes -- throughout the book. There was just so much that really made me think. Do I mean it when I forgive someone? Or am I just forgiving them because that makes me feel better? Do I trust God when things are a mess? Do I hold on too tightly -- to people, to stuff? I highly recommend this book. But I do want to throw in a caution. If you haven't read other books by Fisher, this may not be the best place to start. Early in the book, I couldn't shake the feeling that if this was the first of her "Amish fiction" titles I had read, I wouldn't have enjoyed it as much. I can't really put my finger on it. I think it is Bertha. I don't know -- I guess she doesn't initially feel authentic, and that is one of the things I loved about the earlier books. I don't know a lot, so this isn't an educated evaluation of how "really Amish" these books are. But in the first two, they just felt real and authentic. The Search did too... eventually. But not initially. Bertha just seemed wrong. And you can win an iPad or free roses. I'd love to win either... but I'd have to have the roses delivered to my husband at work. I do not believe anyone delivers out here! Wouldn't that be fun? 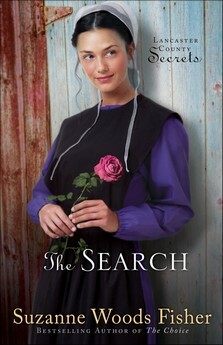 Suzanne Woods Fisher's latest installment of the Lancaster County Secrets, The Search , is just out and to celebrate Suzanne is hosting The Search iPad Giveaway! Join Suzanne for the Everything is Coming Up Roses Facebook Party on February 3rd! She’ll be announcing the winner of the The Search iPad Giveaway, hosting a book club discussion of The Search, giving away copies of all three books and HEAPS of other readerly prizes! Including roses delivered to your door for three months for you AND a friend! Be sure to join us on Thursday, February 3rd at 5:00 PM PST (6:00 MST, 7:00 CST & 8 EST) at Suzanne’s Author Page.